Thank you Bill!! What a nice surprise it is. Proceeds help to fund activities for my son's Boy Scout troop, which are wonderful, but expensive. 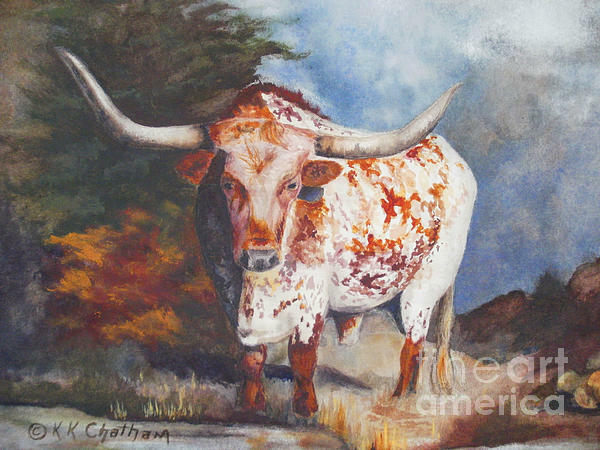 "Lone Star Longhorn" watercolor painting by Karen Kennedy Chatham is a perfect description of Texas tradition. 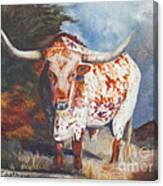 Painted from Karen's original photography,this pure blooded longhorn resides at a centennial ranch near Forestberg in North Texas. 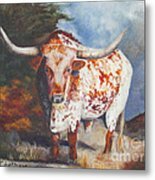 Southwestern Artist, Karen Kennedy Chatham, is a realistic and abstract painter of Wild Mustang Horses, Texas Longhorn Cattle, Western Cowboys and Native American Culture, working in the mediums of oil, acrylic, watercolor and pastel. 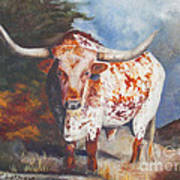 Born a native Texan, Karen has a deep love for western culture and her favorite subjects are the horses. Karen extends a generous "Thank you" in advance for your purchases and hope you enjoy the art God has given for many years to come.